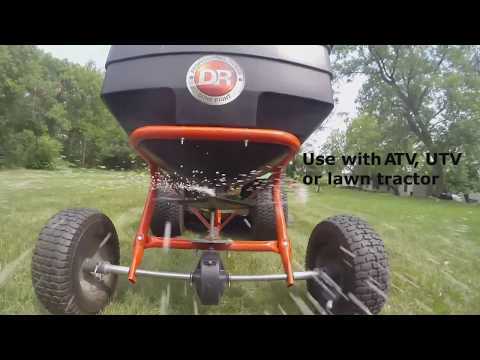 Spread fertilizers, soil amendments, seeds, and other granular materials easily with the Tow-Behind Broadcast Spreader. Holds an impressive 20 gallons. The Tow-Behind Broadcast Spreader quickly scatters seeds, fertilizer, pesticides, de-icer or any dry, granular material. A totally enclosed gearbox keeps out harmful dirt and grit and turns smoothly. Cover up to 40,000 sq. ft. with a full 175 lb. load (max. 20-gal. capacity). Stainless steel flow plate and guides. Also features a flow control lever to regulate the amount of material being spread. Worked great , took grate out of when broadcasting because was seeding oats and pasture mix and would not let enough through . Think oats was to big for grate but worked great . We have 1.5 acres that we sodded and needed to treat with lime pellets. I ordered this. I had a few minor problems with some parts, but customer service was on it immediately and sent me the parts to replace the damaged ones. This is PERFECT for Large yards. My next purchase will be the pull behind sprayer for weeds and stuff. The only recommendation I have is if they can invent a mirror or something to know that the bucket is empty. I can't see it from the mower even in a turn. I have to slow way down to see if it is still spreading. I'm not complaining.... Sure beats pushing it. We also have the DR Vacuum. I LOVE THAT ONE> but that's another review. One more thing. It would be nice to be able to control the opening while sitting on the mower. As it is now, My husband pulls the lever when I get to the grass. Small detail. The Broadcast Spreader worked great. There is no way to open or close the hopper from the lawn tractor, so I drilled a hole in the handle and attached a length of 1/2 PVC to extend the reach. It worked fine, although you haver to keep the lever actively pulled forward, or it will work its way closed again. Seems well made and fairly easy to assemble. I have 9 acres of lawn to take care of. This was the perfect size spreader for me to tow behind my ex-mark zero turn mower and store in the maintenance garage to be out of the way when not in use. Two drawbacks, however, that both go hand-in-hand. One is I can't reach the handle to open and close the gate on the hopper from the seat of the mower. The second is as soon as I open the gate, fertilizers starts dumping out. So basically, by the time I open the gate and get back in the seat of the mower, put it in gear and go, I've already lost about 2-3 cups of fertilizer before I start moving. The same problem exists when I stop and have to put the mower in neutral and apply the parking break, so the mower doesn't stall when I get out of the seat to close the gate on the hopper. My solution to this problem is my reach tool that I keep on my mower to pick up trash while I'm mowing. With it, I can reach back with it to pull the handle to open the hopper and push it to close, without getting out of my seat, thus drastically minimizing the amount of lost fertilizer. Other than what I just described, the spreader works great and is just what I needed at the price I can afford with my budget. Like all DR Power products, this is a very rugged unit. I especially like that it has a grease fitting for the gear box. I could not find any other units that had that. It was easy to assemble as you just have to do a final assembly. I would recommend this unit. Q.Would this spreader work with clover seed, or is this seed material too small for consistent spreading? A.Thank you for contacting us. The Tow Behind Broadcast Spreader will work great for dispersing Clover seeds. Please feel free to contact us if you have any other questions. Q.Will this spreader work with Yamaha Viking 700 UTV? A.Thank you for your interest in the DR 175lb Tow-Behind Spreader. The towing capacity of the vehicle needs to be min. of 250 lbs and able to accept a pin-hitch.